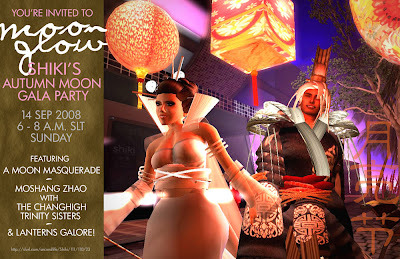 The Autumn Moon Festival, the best-loved festival in Chinese culture will be brought to Second Life™ at the Shiki sim on September 14th. Dating back over 3000 years, the festival is a cultural and visual feast. On the night of the brightest and fullest autumn moon, cities and villages glow with beautifully made lanterns hung from houses, shops and temples and carried by children as they walk along the streets. Today the festival is not only lit by the traditional lanterns, but also by elaborate floats and whimsical light shows. Lanterns are made by children and adults from paper or silk and are decorated with traditional scenes from history.